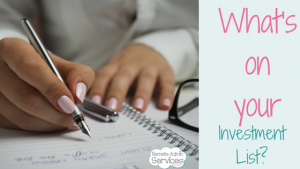 But my investment list I take incredibly seriously, because I am so passionate about what I do for work, and have the thirst to better myself for my clients, this list is so important to me. When I started my Virtual Assistant business I knew I had the knowledge of being a PA/Admin support as I had been working in that field since I left school, but what knowledge I had on running a business I could have written on the back of a stamp, so I spent equal time working and growing my business with researching how to run a successful virtual/online business, and before I knew it I found a list of things that I wanted to invest my time and money in to make my business thrive. So what was on this investment list of mine? 1. Training – this is no different from my corporate days, except I pick and choose the training I want and what is going to benefit my business and help me move forward. Being an online/virtual business there are a wealth of programs/systems out there and always new fancy ones being released regularly. So, it is a case of staying on top of new systems and keep my knowledge levels replenished. Also doing research to see if any new systems that come out could benefit my clients in their business. 2. Software – this ranges from upgrades to new software, we always need to be up to date with our software, and making sure the one we are using now is still the right one for your business, if not sourcing a new piece of software to fit in your business now. 3. Hardware – when I started I had an old laptop and that was it, but over time I have upgraded my hardware to suit my business, I have a new laptop better running system, separate keyboard, bigger screen, this all makes my working day run more smoothly and easier for me to work throughout the day, but have added to my arsenal of hardware, printers, office phone, equipment for recording videos. industries, I am in a few dedicated to Virtual Assistants, but am in a few that are for small businesses, and some that are dedicated to either women in business or mums in business, bizarrely not just for support but those categories are my ideal clients too. 5. Dedicated space – when I first started out I was working out of my kitchen, then a small area in my bedroom, but it became obvious in the early days of running my business that I could benefit from that space, as a VA I don’t really need a dedicated space as everything is predominantly online, but I felt I needed that place where I was undisturbed, not just from people but household chores that were staring me in the face all the time, I was lucky to have a Summerhouse at the end of my garden that we could convert, and that is now my office or ‘The Cabin’ as its affectionately known as. My list is always evolving like my business, so my list changes over a course of time, what may be on my list now, may not be there if I decide a different direction. 1. Audio equipment, even though I do video’s I want to move into podcasting and webinar support, so on my list for future investments is a new external microphone, podcasting/webinar software and a better camera. 2. Courses – I can’t get enough of information, there are a few courses that have a monthly cost that I want to start being part of probably from the new year. 3. Accreditation – As a VA I want to be seen as the professional that I am, so I am working towards and getting the things in place to become fully accredited with VIPVA association, this is more something for me and my peace of mind, gives me that little bit of security and back up from an association. outsource too I see those benefits of not having a job you procrastinate over sitting in your trays! I would like to outsource my accounts, I would like to start as I mean to go on with my accounts, as my business grows it would be nice to have that person working with me on my accounts and making sure all is in place and correct. Yes even a VA outsources. So what is on your investment list? I certainly cannot tell you what you should have yours, as everyone’s list is going to be different. You may have all the equipment you need to run a successful business, but may not have that support network around you, so that could go on there. As I said it’s not necessarily all about monetary investment, it about making your business work with you and becoming fruitful in all ways. Your list isn’t set in stone either if you have things that were on your list they can be tweaked, our businesses change on a regular basis, mine has changed a lot over the years, even though the function is the same, other aspects have changed. Don’t keep yourself trap, adapt to your business. Sit down and create your very own investment list, you do not need to put deadlines on them, sometimes they are helpful, but not always necessary. For an example, I want to be fully accredited by the start of the new tax year 2018, so this gives me plenty of time to get all those bits in place.